Cassava flour is a very important ingredient in profitable production of bread. Step 1: Harvest matured cassava from the farm and load it to the processing shed immediately. If the quantity of cassava harvested can not be carried in the same day for logistic reasons do not detach the cassava from the stem and leaf until the vehicle to carry it is ready. That is to say fermentation will not occur if the cassava is still attached to the leaf and stem even if it has been uprooted. But care must be taken not to bruise the cassava when uprooting it. Step 2: Peel the cassava and wash it in clean water. Step 3: Grind the cassava with grating machine. Step 4: Press the grated cassava with screw jack or hydraulic jack. The pressing is very technical and very important. 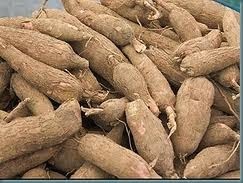 The moisture level of the cassava should be reduced to below 20%. The process from harvesting to pressing must be under 24 hours. If not the product has turned to elubo and may not be good foe baking. After pressing to below 20% moisture level fermentation is completely halted. The next stage is drying. Step 5: Dry to moisture level of below 14% The drier the product the longer the storage life or the shelf life. The moisture level is the most important quality which will be examined at the point of sales. If properly processed as narrated above the colour of the product is snow white. Drying could be by sun drying if the quantity is not much or if the period is dry season when there is no possibility of sudden rainfall. The ideal method of drying is the industrial dryer. Some industrial dryers are capable of handling up to 10 tons per day. If the processing is during rainy season the best alternative is the industrial dryer. They charge their fee per ton. Step 6: Bag into baggco sacs of 50kg and send to the point of sales. At the drying center the product will be tested and weighed in. The moisture level recorded. The will be dried and sold at the drying center there to merchants who process the LPO to supply to the flour mills or bakers. The three tons of cassava is to yield minimum of 1.5 tons of flour. It is more profitable for a cassava farmer to process his cassava to this point if there is labor to accomplish.